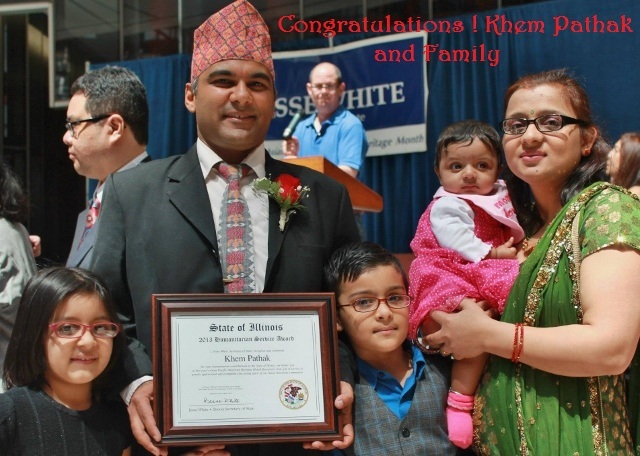 We are very much glad to inform you that Mr. Khem Pathak , an adviser of this organization has been selected for Humanitarian Award 2013 granted by Illinois Secretary of state Jesse White on the occasion of “Secretary of State’s Celebration of Asian Pacific American Heritage Month 2013”, as CNFS nominated him for this award. This award is best upon helping and working voluntarily in Nepali community directly. Mr. Pathak moved in Chicago, USA from Nepal in 1998 as a student. Since then he has been voluntarily helping Nepalese who needed his assistance. He was a founder General Secretary of CNFS 2007 to 2010. He successfully completed his presidency from 2010 to 2012 and currently he is contributing the organization as an adviser since 2012. We would like to congratulate him in his great achievement on behalf of Nepali Community. We are very proud of him that such a great person is working in this organization within this community. We feel like the organization itself honored with his award.